Jatz are great to have in your cupboard for all occasions - whether for a quick snack or a treat for when guests arrive. They are great on their own, to accompany a cheese board or with a dip. 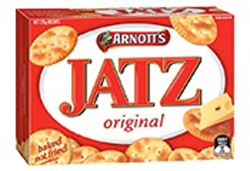 These round little crackers are baked and not fried, contain no artificial colours or flavours, no added MSG and are packaged in foil for freshness, making Arnotts Jatz a healtier alternative too many other snacks.